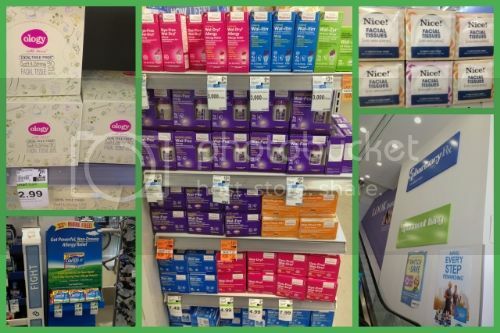 Random Handprints - A NYC Mom Blog... live from New Jersey: Seasonal Allergy Sufferers: Duane Reade and the Poncho Weather Service are to the Rescue! 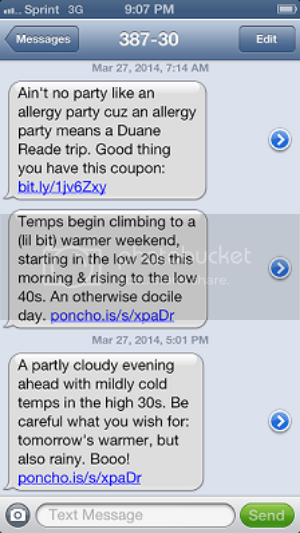 Seasonal Allergy Sufferers: Duane Reade and the Poncho Weather Service are to the Rescue! Did you know I am kind of, sorta, maybe possibly a weather geek? No? I admit it, I am. I follow the Twitter and Facebook accounts of several independent meteorologists. And I also follow the official reports from the National Weather Service, both New York City and Mount Holly, just in case they're different. So you can imagine my interest when I heard about a new app, the Poncho Weather Service, and about their partnership with Duane Reade (you can read more about it on Mashable) to help with seasonal allergies by alerting users which days have a high pollen count and offering a coupon for allergy relief products. Poncho is my new weather best friend. When I signed-up for the service I picked-out a Manhattan Zip Code and provided the times of day that I wanted updates based on when I wake-up as well as when I leave work. I also chose how I wanted the updates (email or text, or both), and now I get my latest weather forecast right on my phone via text as well as in my email. It's awesome. 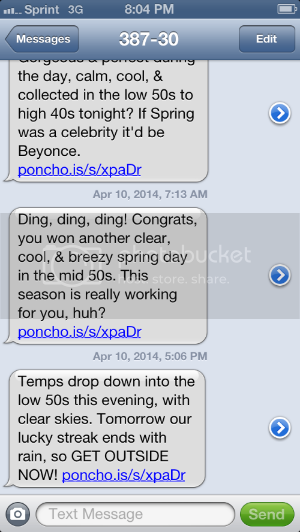 One of the many reasons I love Poncho is that the weather forecasts are so fun. One day last week I got an all caps directive to "GET OUTSIDE NOW!" Another day it was "You guys, I've met someone new. Their name is Spring, & I think it's love." In addition to personalized weather reports, Poncho has subway and train delays based on the commuting information provided, and if you choose, allergy alerts. As I am one of the many who suffer from seasonal allergy symptoms, I'm glad to be alerted on days when the pollen count is low, moderate or high. 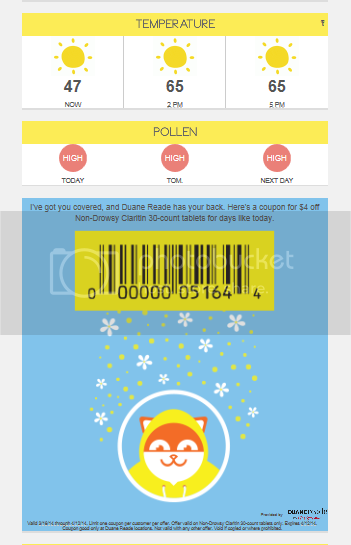 And, Poncho goes one stop further and even has coupons to save on allergy relief products at Duane Reade. 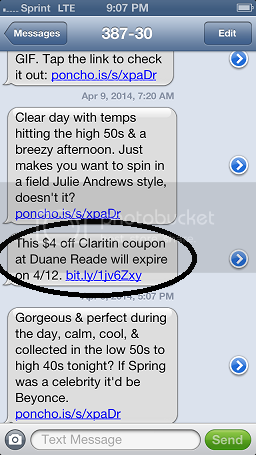 My favorite text so far: "Ain't no party like an allergy party cuz an allergy party means a Duane Reade trip," with a link for $4 off Non-Drowsy Claritin. A few days later I also got a text reminding me to make sure to redeem the coupon, as it expires soon. When Poncho sent me an email informing it was a high pollen day today, tomorrow and the next day I knew I should stock up with some allergy relief stuff, as I always suffer from seasonal allergies this time of year. Apparently I'm not alone, because when I got to the top of the escalator at Duane Reade there was a huge display that included a variety of allergy medications and the always necessary, tissues. 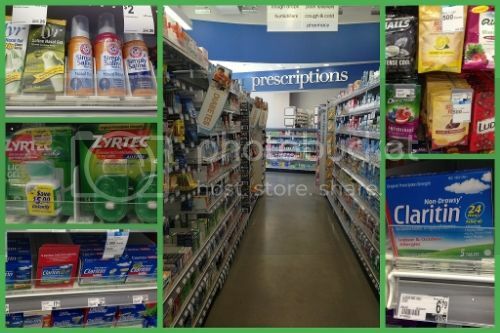 There was also a separate Claritin display, and a huge aisle of allergy relief products. In addition to allergy relief medications, there were also cough drops and saline solutions, really everything you could need to feel better. On my way to pay, I also stopped and got some peppermint tea as I've recently heard it can help allergy sufferers, and I'm always up for trying a new solution. 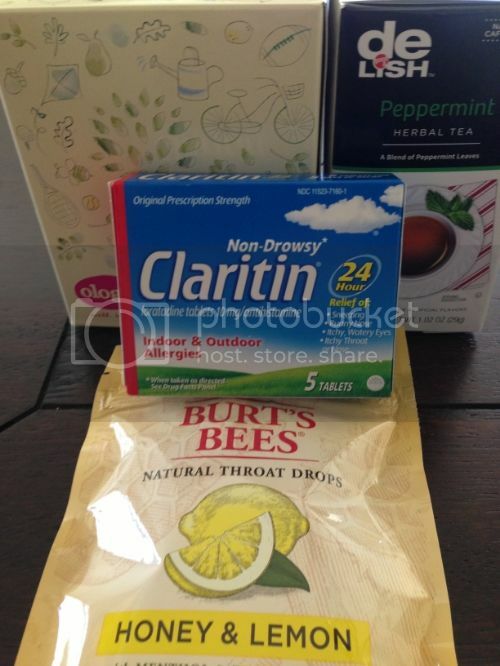 Back home with my Duane Reade supplies, I'm ready to face allergy season and with Poncho weather service, at least I'll know I'll be as prepared as I can be for days with high pollen counts. 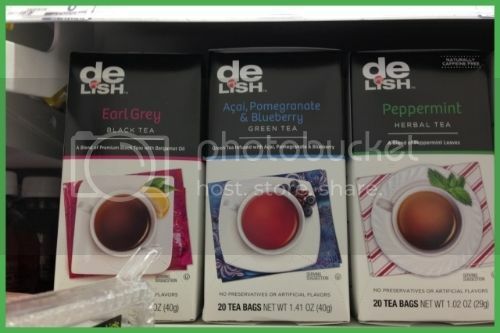 To stay up to date with all things Duane Reade join them on Twitter, Facebook, Pinterest, Instagram and YouTube. I am a member of the Collective Bias® Social Fabric® Community. This shop has been compensated as part of a social shopper amplification for Collective Bias (#collectivebias) and its advertiser (#DRAllargy).